punisher max complete Collection Volume 1 and 2. Issues (#1-30). The Punisher Annual #1 Nice! 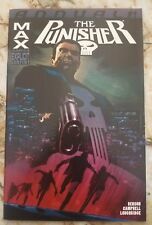 THE PUNISHER #50 (2007) MARVEL MAX COMICS GARTH ENNIS! ULTRA VIOLENT! BARRACUDA! This page was last updated: 20-Apr 17:59. Number of bids and bid amounts may be slightly out of date. See each listing for international shipping options and costs.